﻿Bruce Goodman's "Noddy visits Big Ears"
Noddy felt queer. He had been hit over the head with Police Constable Plod’s truncheon. He needed to snuggle up in bed with Big Ears. So Noddy thought he would go and visit Big Ears. The sun was shining, the birds were singing, and everything was gay. “Hello, little car!” said Noddy as he got in to drive to Big Ears’ house. “Hello, Noddy,” said the little car. The sun was shining, the birds were singing, and everything was gay. 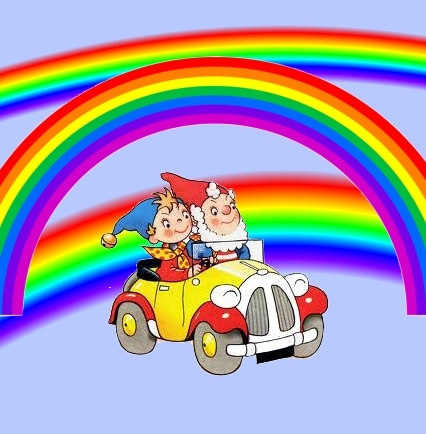 “Hello, pretty traffic lights!” said Noddy as he drove along the road. “Hello, Noddy,” said the pretty traffic lights. The sun was shining, the birds were singing, and everything was gay. “Hello, happy little gate!” said Noddy as he reached Big Ears’ house. “Hello, Noddy,” said the happy little gate. The sun was shining, the birds were singing, and everything was gay. “Hello, dear garden path with flowers!” said Noddy as he skipped down Big Ears’ path. “Hello, Noddy,” said the dear garden path with flowers. The sun was shining, the birds were singing, and everything was gay. “Hello, sweet little door!” said Noddy as he knocked on Big Ears’ front door. “Hello, Noddy,” said the sweet little door. The sun was shining, the birds were singing, and everything was gay.